Location: Mounts directly to ceiling or to standard octagonal electrical box. Alarm: Signal through POPEX data bus. Tamper: Signal through POPEX data bus. Signaled as missing. Trouble: Signal through POPEX data bus. Voltage: Power comes from two-wire POPEX bus. Note: Do not leave Walk Test LEDs enabled. 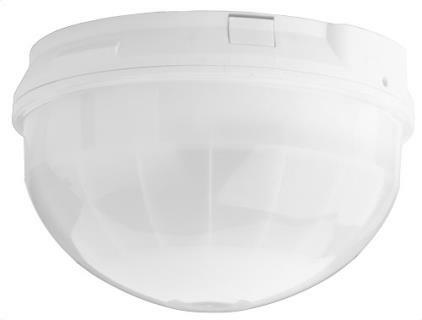 Provides PIR, 360° x 18 m (60 ft) diameter coverage and 2.5 m to 6 m (8 ft to 18 ft) mounting height. Provides PIR, 360° x 18 m (60 ft) diameter coverage and 2.5 m to 6 m (8 ft to 18 ft) mounting height with internal POPIT. Designed for 4 m (13 ft) to 6 m (18 ft) mounting height. Shipped in packages of three.